It does not take long to see what matters most in our society: the bottom line is the proverbial dollar. Watch the news for more than a few minutes and you’ll discover it’s the economics that drives political decisions. Does it have to be this way? Justin Welby – one time oil man for a leading multinational, now the (much more humbly paid) Archbishop of Canterbury – thinks not. Welby’s Dethroning Mammon is an often challenging critique of our approaches to money, but this is neither an economics textbook nor an arid work of theology. Naturally, Welby writes from a Christian worldview, and he writes, too, from the perspective of a leader whose role is both national and international. He states that he wishes for his work to be useful to a wider audience, and even Mark Carney, Governor of the Bank of England, was spotted (according to social media) reading the book on the tube – which has by all accounts done nothing to harm the Archbishop’s sales! Dethroning Mammon is both public and personal in its implications. Behind much of Welby’s case (or ‘thinking aloud’ as he terms it) is the spectre of the 2008 financial crash, the effects of which we are still living with, both the deep seated systemic faults in the banking sector and the vast mountains of personal debt. There are challenges to our government, to the way business operates and to the kind of values our society champions. These have significant implications for the way the most vulnerable are treated. But Dethroning Mammon is also a work which recognises the role of the individual – what are our priorities with money? What do we value? 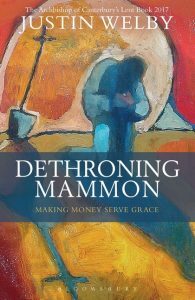 Mammon’s throne is all too easily reigning in the human heart, and each chapter includes questions designed to encourage a reflective reading. Whatever the implications for the United Kingdom, this is at core a devotional book, designed to help the reader consider their own priorities. The problem with Mammon is that it starts in the human heart. Welby’s book is, in this respect, a powerful challenge to most self-help books with their focus on outward success and financial reward. Welby takes us through accounts from the Gospels and the final chapters of the book of Revelation, using both as a way of contrasting God’s values, seen in the life of Jesus, with contemporary values. Beginning with the story of the death of Lazarus in a chapter entitled ‘What we see we value’, Welby asks us to reconsider what we see in the world. Whom do we ignore? How do the groups, societies or institutions of which we’re members look at the world? Whom do they overlook? Next, taking the story of Zacchaeus, Welby considers how what we measure controls us. Financial measurements (especially GDP) skew our grasp of what matters: work which is unpaid, for instance, is not valued, while those who are poor or disabled are not valued. In response to such pressing questions, Welby argues for a divine economics both on a micro and macro level. Generosity of spirit, abundance and grace should replace a self-serving Mammon. All of this sounds a little slushy, but it’s a thoughtful and challenging work, radical in its way of seeing the world. Mammon, Welby warns, is subtle and alluring. An ethic based on abundance and grace, however, has the capacity to change how we see and treat each other, especially the ‘least of these’. Wise, provocative, wearing its learning lightly, humble and thoughtful, this is a book which can be read relatively quickly (I spent less than a day) but it merits a careful, reflective reading, perhaps with others and the opportunity to discuss.